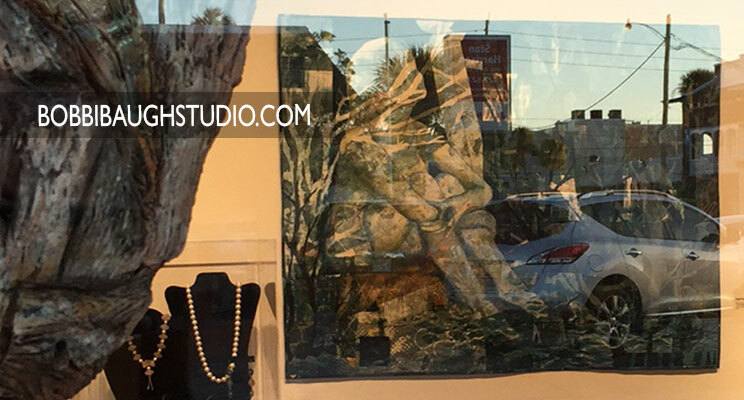 Leaving the gallery opening Saturday night at Arts on Douglas in New Smyrna Beach, through the window I snapped this photo of my newest work displayed there on the wall. Opening the image, I was surprised by my reaction to it. To me it is thought-provoking and poetic. So much to see. Looking into a window is an experience of seeing yourself, the world where you are, reflected back at you. There, superimposed on my artwork, is a car that was driving by. The outline of buildings behind where I stood. Normal city life, the vibrancy of a small town’s business district and the comings and goings of people. Looking into a window is a way of seeing the scene in a frame. Like a painting placed in a square cut mat or an image viewed through a camera viewfinder, the world has been cropped. More is going on inside, but it’s blocked by the window frame. So the objects visible become players on a confined stage. There is my work onstage next to displayed necklaces. Downstage is a large clay work. Everything else is offstage noise. Looking into a window is an act of discovering a barrier. Some things are on the inside. Some things are on the outside. There is a barrier between them. Think of the many songs and movie scenes that capture the feeling of being on the outside looking in. Do people walk by this window who feel like they do not belong inside, that the world of carefully arranged artful objects is a separate universe? Are they allowed to enter? This simple reflected scene provided inspiration for many thoughts. "Becoming One with the Night" is the art quilt I looked at through the window reflections. It's here on my web site in the Journeys and Stories gallery.